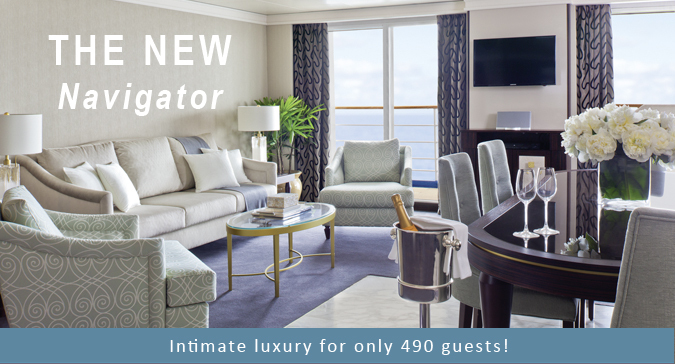 Sailing with Regent is always a luxurious experience, even more so on the all-suite and intimate, Seven Seas Navigator.The stunning, all-suite and intimate, 490 guest vessel has recently undergone a bow-to-stern refurbishment. Come and experience for yourself her new custom-crafted furnishings, designer accessories and outdoor furniture in her renovated suites. Her public areas are resplendent with new plush carpeting and enhancements in Prime 7, the modern American-style steakhouse, so that 70 guests can now be accommodated as well as the launch of the newest, and very popular, dining venue Sette Mari at La Veranda. Embark Navigator and fall in love with her intimate beauty and her stunning and even more luxurious, new look! Call Deluxe Cruises to find out more and book your perfect Regent Seven Seas Navigator Cruise…..